India U-16 dedicate Cameroon friendly win to floodhit Kerala! Home / International Football / Africa / India U-16 dedicate Cameroon friendly win to floodhit Kerala! Sitting miles away and competing with more acclaimed nations who boast of powerful youth development programmes, the India U-16 National Team boys who beat Cameroon U-16 National Team on Wednesday, August 22 are not much willing to soak in the euphoria. “Our heart goes out to the people of Kerala,” Head Coach Bibiano Fernandes stated. “We have been praying for them at every moment and we salute the Indian Army and the rescue workers who are involved in the process,” he added. “Cameroon are a sublime side and it was so satisfying to register a 2-1 victory against them. On behalf of the team, I would want to dedicate this victory over Cameroon to all the people of Kerala,” he uttered. “This victory is more for you than anyone else,” he added. In fact, the Indian U-16 National Team themselves have a player from Kerala. Shabas Ahammed Moothedath from the football-crazy Mallapuram district of Kerala. Shabas played a pivotal part when the colts registered the win over Cameroon, courtesy strikes by Rohit Danu and Ridge D’ Mello. “My family has suffered a significant loss. However, I am fortunate enough that my family is together and safe. My heart goes out to everyone who has endured pain,” said Shabas. “May God give them strength and courage to bear the pain,” Bibiano concluded. 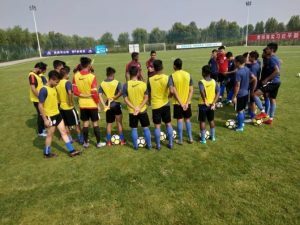 Just a month away from the AFC U-16 Championship finals, the Indian U-16 National Team are in the final gear of preparations for the Championship with wins over the likes of Cameroon adding more to their pedigree. Previous Delhi Dynamos sign defender Marti Crespi Pascual of Spain! Next Accenture & Logitech to speak at 2018 iSportconnect Brands Masterclass in London!